Home What is a Diastasis? Seldom Diagnosed, or even Misdiagnosed, sometimes as a hernia. Can be the cause of many common symptoms, yet the correlation is often not understood. 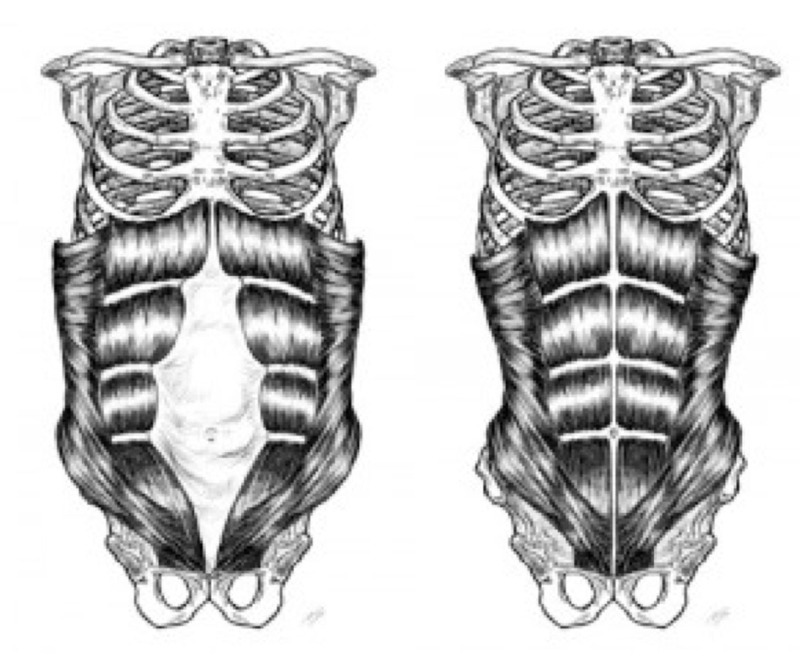 The picture on the right shows our outermost muscles (Rectus Abdominis or 6-pack abs) as they are designed to function; and the picture on the left shows a separation, or diastasis, which is a stretching sideways and thinning out of the connective tissue (linea alba) between the two halves. The purpose of this muscle is to flex our body forward, such as when you bend over to touch the ground. It also helps our organs stay properly within the abdominal cavity. Many things can cause a separation, such as the stretching of the abdominal wall during pregnancy as well as the hormones present that allow laxity. Consistent forceful pressure on those muscles such pushing during labor, holding breath while weight lifting, incorrect potty postures, the consistently chronic rounded forward postures of our daily lives. It can also be exacerbated by exercises that bulge the area such as crunches, sit ups, and planks. What are some symptoms? Chronic back pain whether lower or upper; Urine Leakage; Pelvic floor weakness; Gastrointestinal issues such as constipation or IBS. It can even affect your hips or knees as there is typically no deep internal abdominal strength as well, causing that feeling of not being connected or really weak around your middle. Why do you feel weak in the mid-section even when you are doing 100’s of crunches a day? Because typical abdominal exercises strengthen only the outer abdominal muscles but only stretch out and create pressure against the deepest abdominal muscle, the Transverse Abdominals. Can it be Fixed? Yes – and we are now trained in the Tummy Team Trained Clinician Method. Unlike what most people are told, diastasis recti does not usually require surgery and can be usually be corrected with core rehabilitation. You will be amazed at how closing your diastasis and rehabilitating your core will affect your entire body. Core rehab will close the separation, shrink your waist, relieve back pain and improve other symptoms as well. At Strong Tummies right here in Algonquin Illinois (Northwest Suburb of Chicago) we can help you regain neuro-muscular control of your abdominal muscles and relearn how to use them correctly in all aspects of your life. We aim for functional use of muscles. Our goal is not to get you stronger for exercises, but stronger for life. Call us today at 847-420-9764 to schedule an appointment and get started! A diastasis can be checked both during and after pregnancy. The object is to determine how many fingers will fit in the space between the two recti muscles and to determine the condition of the connective tissue. The deeper your fingers will go towards your spine, the weaker the connective tissue. If you feel a pulsing while you are checking, this is a sign of very weak connective tissue. Start with your middle three fingers. Lie on your back with your knees bent. Place your fingers horizontally at the top of your belly button. Relax your abdominal muscles and lift your head slowly. If you are engaging your abdominal muscles as you check it will give you a false reading as this will make the diastasis appear smaller as the muscles get closer together the higher you lift your head, so lift ONLY until you feel the two sides of the muscles and then follow the muscles back down and that is your measurement. You might have to come up and down a few times so you can feel how the muscles work. If you don’t feel the two ridges of the muscles with 3 fingers you may have to put more fingers in. If you see the football-like ridge you should start by using 4 to 5 fingers. You may even have to use two hands if your diastasis is very large. The condition of the connective tissue. The further your fingers go into your belly, the weaker the connective tissue; the weaker the connective tissue the longer it takes to heal. As the connective tissue becomes shallower, the muscles come together. If you are in the Chicagoland or surrounding areas call to schedule a Belly Check at our office in Algonquin Illinois. If you are not in our area, please check out the video on this page from Kelly Dean of TheTummyTeam.com, How to Check for a Diastasis.